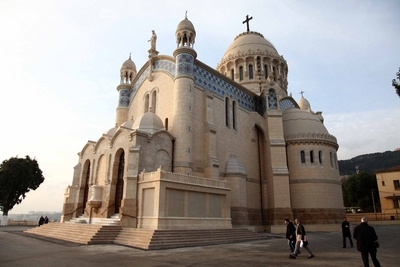 The 19th c. CE Notre Dame d'Afrique Catholic Cathedral, restored 2011 -- Photograph Via Wikimedia Commons. ALGIERS - Notre Dame d'Afrique sits on top of a cliff overlooking Algiers. It was completed in 1872 and since then has been one of the landmarks of the Algerian capital, its neo-Byzantine style architecture with an impressive dome standing imperially over a city that still reflects, despite its present shabbiness, the legacy of France. The Church now stands practically empty, guarded by a contingent of armed police. It symbolizes today something entirely different from what the French had once imagined. Its emptiness speaks of how beleaguered is Christianity, or any other minority faith, not only in Algeria but right across the Arab-Muslim world. Christians and Jews were once a vibrant part of the North African culture. Early Christianity thrived here under the authority of St. Augustine, the most famous son of Algeria who remains unknown to most Algerians. History is never simple. French-Algerian history, as is European-Muslim history in general, has its share of terrible things done on both sides in the mistaken name of some higher principle. But every generation, as the German historian Leopold von Ranke noted, stands in equidistance from infinity or God. In other words, every generation is responsible for deeds done and their consequences, and past wrongs cannot be an excuse for wrongs done in the present. In March 1996, seven French monks belonging to a Trappist order were kidnapped from their monastery in Tibhirine, set in the mountains south of Algiers, by Islamist terrorists. The monks were murdered, and such a horrible crime was not an isolated tragedy that might be dismissed as the work of evil men. It was a crime that reflected, among other things, the intolerance among Muslims of others and other faith-traditions, and how this intolerance has besmirched Islam and its place in our world. There was a funeral mass held at Notre Dame d'Afrique for the murdered monks. But I could not verify if mosques in Algiers offered prayers for those killed who had worked in Christ's name among the poor of Algeria. And herein lies the unspoken problem of the Arab-Muslim world. There is among Muslims no public discussion about Jesus; nor do Muslims display reverence or understanding about Jesus and his place in history, yet they readily indulge in anti-Christian polemics. As a result, Muslims have emptied Islam of that aspect of humanity nearest and dearest to God symbolized by Jesus in the Qur'an. The Qur'an refers to Jesus as "ruh Allah" meaning the breath, or spirit of God. In emptying Islam of Jesus, Muslims have taken the spirit out of the Qur'an as the word of God. Hence, Muslim poverty reflects much more than politics and economics. It is, as I observe this phenomenon, an effect of Muslims having turned Islam into an arid and intolerant religion.